Cmd+W closes the window instead of the tab. Also, it makes sense to enable window closing confirmation. Everyone, my most sincere apologies, I read some information wrong: the fix for the remaining issue that occurs after opening a new window was not backported to O58 in time for the initial release, so it'll only be in the next O58 update to come along. This will be released at the start of next week. @headspacedude So please could you explain to me why the Cmd+W shortcut works perfectly for closing tabs and not windows in Chrome and Firefox? 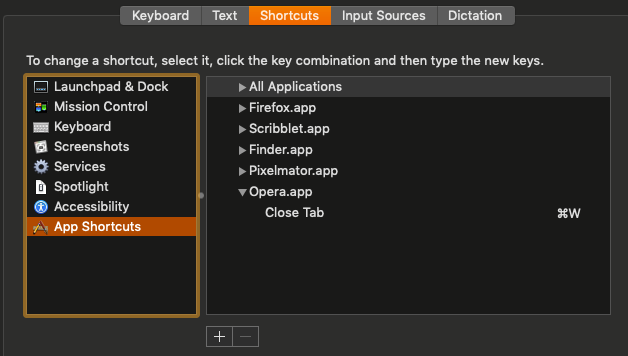 It's not an incompatibility with system-wide macOS shortcuts, it's an Opera bug which is still waiting for a fix. Yes, just to be clear, this is an Opera bug :). It appeared when updating to macOS 10.14 because Apple changed the behavior of how often menus and shortcuts get refreshed. This may be an Opera bug but it is definitely not confined to macOS. I've been using Opera on macOS Sierra (10.12.6) and two Windows 10 machines and keep getting the same annoying behaviour. All was good until November 2018. Tested on multiple Macs and still happening with latest version. This is very annoying, as Chrome, FF and Safari don't have such a bug. Has anyone tried creating a keyboard shortcut under App Shortcuts to override the Close tab shortcut? It may sound weird, but it is worth trying as a user-side patch if it does work. I'm currently using this now but I cannot recall the last time it has closed the window so I want to see if this idea can work for others too. @ant8672 Interesting, thanks for the suggestion. Still happening for me (Mojave 10.14.3, Opera 58.0.3135.65). Extremely annoying and no improvement after the latest updates. Clearly an Opera bug — I use this shortcut a lot and no other app ever had this issue. How long this one will stay unfixed? This is ridiculous.. Updated to the latest version 58.0.3135.68 but the problem is still there. And that's clearly an Opera bug, as I use Cmd+W a lot across all apps and no other app has ever had this problem. The solution proposed by @ant8672 worked for me, in the absence of an internal Opera fix. 58.0.3135.68 - still happening a lot. 58.0.3135.90 - cmd+w closes the window (intermittent issue). Also window close button sometimes closes another window. Extremely annoying. Public bugtracker would help significantly in cases like this. Everyone would be able to track the status of the issue instead of complaining in comments. They probably would complain about the status of the bug.